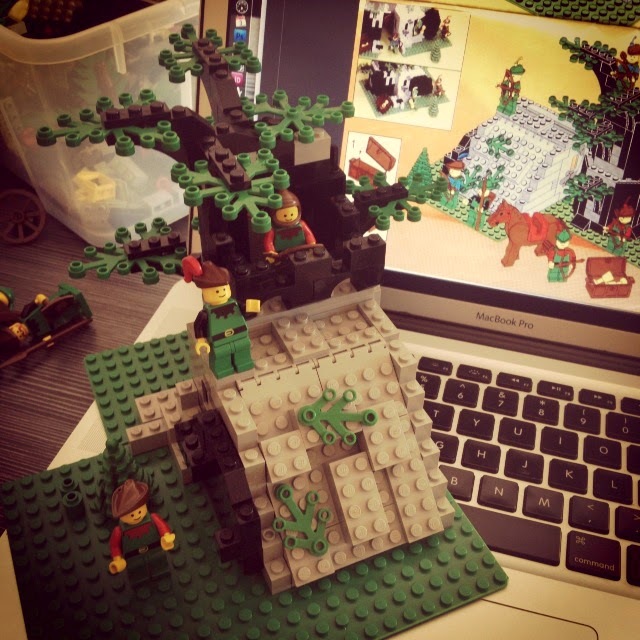 Ferrous Lands: Miniatures and Book Reviews: Rebuilding my 25-yr-old Lego Forestmen set. Rebuilding my 25-yr-old Lego Forestmen set. This weekend I went through my bins of 25-yr-old Lego bricks, and my daughter and I re-built this old set. My original instructions were missing, but I found them online. This is set 6066 Camouflaged Outpost from 1987. It has lots of cool secret doorways. It turns out my old Forestmen Lego minifigures are worth a small fortune. According to eBay they sell for about 5 bucks each! My kids really enjoy playing with Legos, so we plan on getting into building a Medieval / Fantasy village and maybe playing some tabletop games with the figures. Man, I had this set too! Lego is just great. My brother an I had tons of these growing up, Lego Pirates too. Check out Brickwars. The kids love it.